Whoever Allah guides none can misguide, and who-ever He allows to fall astray, none can guide them aright. We bear witness that there is no one (no idol, no person, no grave, no prophet, no imam, no dai, nobody!) worthy of worship but Allah Alone, and we bear witness that Muhammad (saws) is His slave-servant and the seal of His Messengers.The Prophet (saws) said in an authentic narration: “The foundation of Islam is based on five pillars.To testify that none has the right to be worshipped except Allah, and Mohammed is Allah’s Messenger.To establish the (obligatory congregational) prayers.To pay Zakat (obligatory charity).To observe fast during the month of Ramadan.To perform Hajj (pilgrimage to Makkah). Now, we need to make a simple comparison between what has been reported from the Prophet Muhammad (PBUH) and what has been supposedly reported from Imam Jafar us Sadik.The obvious difference is that from the original five Pillars of Islam as reported by the Prophet of Allah (PBUH), one has been removed (i.e. Shahaada,) and three have been added (i.e. Walaya, Tahara and Jihad). The new pillars of ‘walaya’ and ‘tahara’ were prioritized and added above the original 5 pillars declared by the Prophet of Allah (PBUH). There is absolutely no mention that Imam Jafar us Sadik reported these 7 Pillars of Islam from the Prophet of Allah (PbUH). It simply says, “From Imam Jafar us Sadik…”There is a time gap of at least 225 years between the narrator of the Seven Pillars (Imam Jafar us Sadik) and the author of the book, Da’iam al Islam, Qadi Al Noa’man.There is absolutely no mention of the “isnad” (list of narrators) in the whole Da’iam ul Islam, linking how did Qadi Noa’man receive these words supposedly narrated by Imam Jafar us Sadik. The author simply says 225 years after the death of Imam Jafar us Sadik, that he narrated it! This is absolutely against the principles, rules, and practice of reporting narrations. The book Da’aim al Islam (page xiv) also goes on to claim that the three pillars were “added” by the Fatimid Imams who formed their dynasty from Egypt in the year 341 (a.h. after hijrah) upto 567 (a.h.), thus negating the earlier statement in the book that these seven pillars were narrated by Imam Jafar us Sadik. 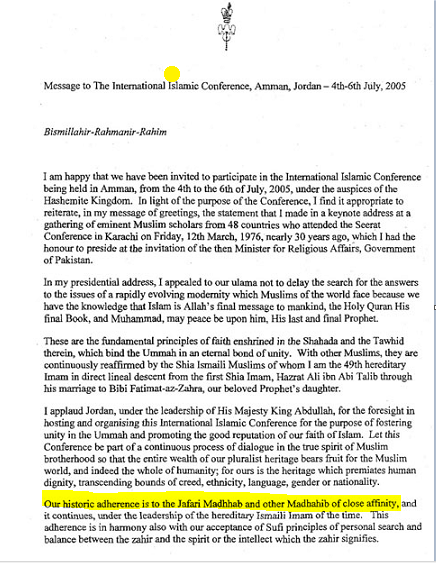 Now coming further down to the hypocrisy of Ismailis where their present Imam is claiming to be following the Jaffri Madhab in a letter to International Islamic conference in Amman Jordan in 2005. Please see image below to read the letter and also focus on the highlighted sentence by Agakhan He claims to be following the Jaffri madhab but they actually are not. They have reinvented the faith to fit their needs. Zakat (Dasond) has been increased to 12.5 percent. Sawm (Fasting) has been forgiven. Ritual Purity has been dismissed. Dear Ismaili brothers and sisters, your present Imam is lying to the public and fooling you big time. Please come back to real Islam and you will surely find peace in it InshaAllah. Worship none but Allah Alone and that is what the Hazrat Ali (RA) did. The choice is yours: Follow Allah and Allah’s Messenger (saws) and form your beliefs and the Islamic constitution from the Holy Quran. Or ‘forget the Glorious Quran, and follow the book written by Qadi Noaman and make that your constitution, in preference to the Holy Quran. The ‘supposed’ pillar of ‘walaaya’ was constructed by Qadi Noaman, and has absolutely no basis and no authority from the Book of Allah; the Al Quran, nor from the Sunnah of the Messenger of Allah (PBUH), nor has the author given the ‘isnad’ (list of narrators) that these ‘extra’ pillars were added by Imam Jafar us Sadik. It is indeed inconceivable to imagine that a scholar and leader of the stature of Imam Jafar us Sadik would dare to change the words of the Messenger of Allah (PBUH), remove one pillar and add three pillars from himself. Well it is not correct to be use ‘your present imam .. ..
We ismailis are very proud of him and his ancestors. They have dedicated their whole lives for our wel beings. A 100 years ago our forefathers use to work in grave yards in INDIA..
Sir,I don’t know whom am l writing to ? You are talking to an Ex Ismali who left Ismalism and accepted true Islam by Allahs guidance. There is no harsh thing which has been used in the posting. And this site is not against Ismailis but against the false practices in Ismailism. You shouldn’t be offended or feel bad about it at all. What has been written in the article is pure thruth. Your Imam himself has acknowledged in his letter that your his community follows Jafri Madhab. Hope that clarifies everything. What is correct then ? Is he not your present Imam ? Kufr ul-Istihal: Disbelief out of trying to make haram into halal. This applies to someone who accepts as lawful (halal) that which Allah has made unlawful (haram) like alcohol or adultery. Only Allah, subhanahu wa ta’ala, has the prerogative to make things halal and haram and those who seek to interfere with His right are like rivals to Him and therefore fall outside the boundries of faith. no idea the concept of religion. They have opened up a business in the name of religion. Cheating, lying and deceiving the innocent followers the ex-Hindus who are blinded by the dajjal fake Imam. If Ismailis are doing any progress in life is because of their own karma that has nothing to do with Imams. Keep up the good work of giving out the truth of Allah. Agas have nothing to do with any of the previous Imams mentioned in their Hindu Dua and in history. The first fake Imam created a new religion for Hindus just to loot them and be rich. to answer a few questions: What is the religion of Agakhan? Where does he go for prayers? mumbo jumbo Hindu rituals made up by the fake Imam Sultan? any of the Jamat Khana temple????? In Paris, or Pakistan etc. the Quran is made haraam, as he claims he is the walking talking Quran (Astagafirullah). Only the Iblisi dajjal can make this clam. You have all the answers if you answer these questions rightly. May Allah Guide you all lke HE guided us to HIS Light. 1. Why do Ismailis change the 5 pillars of Islam? there is no encouragement to fast, do charity, pray 5 times daily, or pilgramage. Instead, Ismailis believe that visiting the Aga Khan’s congregation is a must. 2. How did Ismailism form? how did it first start and how did it gain followers? Why did it decide to separate from 12er Shias? 3. How does one become or appointed a Hazar Imam like the Aga Khan? 4. The Quran is crystal clear that associating somebody with Allah is considered the worst sin, so why do Ismailis pray to the Aga Khan and ask him for help/forgiveness/guidance/etc.? 5. Why is the Ismailis’ prayer they perform Jamat Khana so strange and unique compared to Sunni or Shia practices? like not having to perform Wudu before praying and not facing towards the Quba. Please folks, help me understand Islam. I really want an answer from a Ismaili who can help me because I cannot find help from the Jamat Khanas. It feels wrong to ask questions like this in Jamat Khanas because nobody questions anything; I don’t want people thinking wrong about me if I question Ismailism. I wish we had a session like in a Mosque where a shaikh is able to answer questions in regards to religion. Salamalaikum. My email address is jsurani786@yahoo.com. please email me so we can get connected and seek knowledge and guidance from Allah. I have left Ismaili madhab long time ago luckily my father chose not to be ismaili and follow sunnah. Allah have opened the first door for you because you are already asking question and that’s what Islam is. We need to always ponder and ask questions like Allah says so many places in Quran for the people with sense to see all the signs in creation on Allah. InshaAllah we can get connected and try to search for truth. Salamalaikum. towards you. So you are going in the right direction.Allah will help you InshaaAllah. Ismailis are kaafir & Agha Khan is a Fake man. These all bloody Ismailis will go in hell. Ismailis and Agha khan both are fake. Allah Quran & Allah’s messenger (pbuh) only right. Agha khan is a devil & making other fool. Ismailis go to hell. 1. Seek help from Allah (SWT) to guide you to the right path. 2. Study every thing about 1st chapter of the Qur’an. In Arabic or in English (translation(Abdullah Yusufali or or others and tafsir by Ibn Khatir and others) Learn how to recite it with tajweed (learn the rules of Tajweed properly) Loads of good sites on the web to learn all this first. 3.Put your trust in Allah and learn to offer Salaah. 4. Then compare it what is practiced by Ismailies at JK to understand the issues you face regarding your worship. this site explores all the aspects regarding Ismaili beliefs.